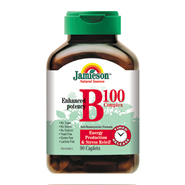 Jamieson timed release B complex 100 is a balanced, superior strength formula containing eight essential B Vitamins that make up the B complex family. The timed release formula allows for a gradual release of vitamins over 6 to 8 hours. Timed release enhances your ability to digest and absorb the vitamins more effectively since smaller amounts are released over a period of time. Vitamin B100 complex helps to maintain overall good health by helping to prevent nerve damage, promoting cell development, promoting healthy brain and nerve functions, assisting in the metabolism of fats, carbohydrates and protein, supporting cell development and red blood cell formation, treating cataracts, increasing circulation and promoting the secretion of bile from the liver. Each caplet contains: Vitamin B1 100mg, Vitamin B2 100mg, Vitamin B3 100mg, Vitamin B6 100mg, Vitamin B12 100mcg, Biotin 100mcg, Pantothenic Acid 100mg, Folic Acid .4mg, Lipotropic Factors: Choline Bitartrate 100mg, Inositol 100mg. Also contains Para-Aminobenzoic Acid.